Cooperativa Neue Musik, a sound art community in Bielefeld, Germany has invited Bernhard to present his work on April 8, 2013 as part of the Jour Fixe series of artist talks. Bernhard will talk with the freelance music journalist Kurt Gerland in an open discussion about his approaches and his concept for his contribution to the the upcoming music festival “Diagonale” (Oct 5 & 6, 2013, Bielefeld and Gütersloh) which will be held under the motto “swarms”. We hope you can come along! 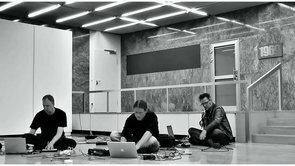 centrozoon’s “Fire” documents the complete evening of recordings at the foyer of Gütersloh’s town hall in June 2011. Bonestarter has been running for half a year today!